@sam.ward: Do you think the reforms passed since 2007 have been sufficient to crack down on corruption, or do you think what happened with you could occur again? I think the reforms of 2007 were well-meaning, but when I was in prison and read them, I immediately saw how I could continue virtually everything I was doing, if not more. @votey.mcvoteface: Thanks for joining us Mr. Abramoff. Do you think it's fair to say that lobbyists wouldn't be nearly as valuable if we had comprehensive campaign finance reform and politicians had more time to educate themselves and engage more. Like your moniker! I think reforms could help tremendously, but I am against public financing of campaigns. I think the reform that would be meaningful would be to bar lobbyists and their clients from using their money in a federal election, or in any way participating in financing (bundling) for a federal election. There are other things are well, but that would be a great start. Also, yes, members/staff should educate themselves more, but really how many hours in the day are there? They do need lobbyists to help, but those lobbyists shouldn’t be more than information conduits. When they start conveying money etc that’s where the problem starts. @rebel.dnc.staffer: What are you doing now? What's next for Jack Abramoff? I used to produce (feckless) action motion pictures. I’m now working on producing (unfeckless? Non-feckless? Feckful? ) TV programs. Plus, I do a lot of public speaking on the scandal and corruption. Oh, and I am getting ready to be offered Minister of Lobbying in the Trump Administration! Kidding! @notanintern: What moment of lobbying are you most proud of and why? Hard to pick out one moment from so long ago, but I was very happy when we were able to stop a major and debilitating federal tax on Native American tribal governments. @kerry.arnold: In your opinion, what is the worst form of corruption prevalent on Capitol Hill today? The corruption on Capitol Hill, and in Washington in general, is very subtle. I think the most corrupt behavior stems from public servants arrogating powers to themselves, and lobbyists encouraging it for the benefit of their clients. I am ashamed that I did so with aplomb in the old days, but it still goes on. @notanintern: What piece(s) of advice would you give lobbyists today to make them more effective? My advice to lobbyists, and everyone in the process is to realize that the world is watching and that they need to learn all the rules and not break them. as for making the more effective in their job, beyond that advice, they need to know EVERYTHING about their issues, they need to know what their opponents are thinking (so, role play a lot) and they need to know how different people will react to their arguments. It’s a tough job, and there’s a lot to do as a lobbyist. People don’t realize that. @wholistic.thinker: How do you think we can overcome lobbyists fighting for subsidies that no longer serve a purpose or their intended purpose? The only way for public servants to overcome powerful lobbyists is to not take their goodies (including campaign contributions) and to listen to their arguments, but always get the other side as well. then your decision can be made on the merits, which is what is supposed to happen. @bell.fogg: I'm an LA. I have zero interest in fundraising. What should I do when my boss orders me to attend a fundraiser with him? That’s a hard question, since your boss might make sure you are gone if you don’t do what he/she asks. I guess in part it depends on what happens at the fundraiser. If you can avoid accepting the gratuities that are legal (food, etc) at the fundraiser, then it’s better. The real issue is what the lobbyists will ask of you while you’re there, or worse, what your boss will ask of you for them while you’re there or after. If your boss makes you uncomfortable with what has become very commonplace unfortunately, then you should try to leave and find another job. I’m sorry you’re in this position and wish you the best. @sam.ward: Are there any lobbyists or groups trying to promote better ethical standards and self policing of the profession? Also, forgot to thank you for joining us. Appreciate your insights. Issueone.org is good. represent.us is good. Both advocate things I don’t completely support, but they are heading in the right direction. Also, even though I’m a conservative, I have tremendous respect for the folks at Public Citizen. I don’t agree with them on a bunch of stuff, but they are honest people, particularly Craig Holman and Rob Weissman. @notanintern: Have you ever thought of running for office and campaigning on the platform that you know how to expose and stop corruption in DC? I don’t think a run for office by me would go very far. Don’t forget felons can’t even vote in most states and I am most decidedly a felon. Plus, can you imagine what a Trump-like opponent would have to say about me? He’d nickname me Felon Jack, instead of Casino Jack (which I don’t like in any case)! @rebel.dnc.staffer: What do you think the effects have been of the ethics reforms passed in the wake of your lobbying scandal? I think the reform groups pushing those reforms were very sincere, but the process is controlled by the leadership in the Congress and both parties leaders have traditionally been in favor of retaining the system. @baldwin.sumner: Will lobbyists be able to influence a potential Trump administration? I think lobbyists will LOVE either Trump or Clinton. Trump’s campaign is controlled by lobbyists (including Trump himself who is a self admitted purveyor of cash to public servants) and lobbyists never loved an Administration like they loved the Clinton Administration, including me (unfortunately)! @bernie.bros.4.trump: Who are the worst actors still in business in Washington today? Not sure who are the worst actors today, since I’ve been out of it for a while, but I can tell you think much: the worst actors are the ones you will never hear about. I would have been anonymous as well, given my choice. Publicity is not something lobbyists seek, at least not if they are smart! @f.sjl: Do you think a large increase in total staffers on the Hill could combat the influence of lobbyists? A complaint I hear often from staffers is that they have to be used as Subject Matter Experts due to the consolidation of portfolios. I think a better approach – both for the folks on the Hill and for the people in the nation – is to pare back the reach of the federal government and congress. You are correct that the requirement for expertise makes your job impossible, but with more staff will be more overreach. We have to get the feds out of the things they have invaded. That’s the only solution, in my view. @alexander.slamilton: Hi Jack, we appreciate your time. Any thoughts on if Congressional staff were better compensated that they would keep themselves and their knowledge on the Hill rather than join a lobbying firm? Would that make for better policy/less corruption? There’s no question that many of the folks who left the Hill to come work for me needed to earn more money, and for some, they might have stayed – but others were just bored or burned out. the pressure on the Hill (depending on the job) is not something healthy for people. The solution is to get the fed gov’t out of our lives and pared back. When there are fewer areas of federal involvement, the job becomes more manageable. Of course, that is easier said (typed?) than done. @fogg.mcmahon: Any advice if someone is looking to transition to lobbying? My advice is that you make a list of everyone you know on the hill in any meaningful position. Also in the administration. And then you rank them in a way so that you know which of your contacts are strong and which are more tenuous. That is your coin of the realm, and what the lobbyists will want to know – assuming that’s where you want to go. You need to show them that you’re connected, but you need also to show them that you can write and present. Those are key skills. Finally you need to make sure that you are an expert in the things you worked on while there, and that you know process cold. @locke.bell: Who is more corrupt, Dems or Reps? There are corrupt Republicans and corruption Democrats and there are honest members of both parties. Corruption is not a partisan matter. @dudley.morris: I feel like the time I'm putting in as a staffer now is to get enough experience to get a good lobbying job that pays well in the future. Is that wrong? Would you offer any suggestions for alternate career paths? I’m not sure it’s wrong, because that’s the state of play and that’s the law (that you can do it). If I were able to wave a magic wand, I would say that the revolving door should shut, but while it operates, it is not illegal. Having said that, if you can find something else that’s meaningful, enjoyable and can sustain you financially and in other ways, why not pursue that. 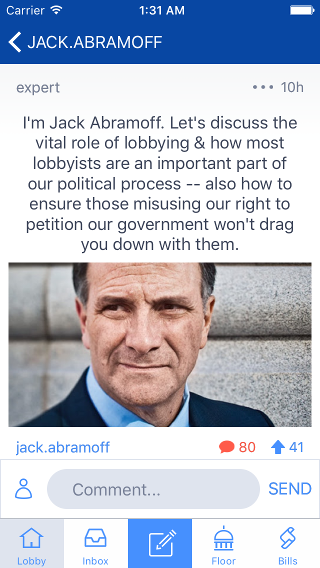 Lobbyists are (unfairly, and not just because I was one!) looked down upon in our society. Why join a group like that, unless that’s your passion – which I would totally get, unfortunately. @cameronpig: Thanks for joining! I've often heard it said staff go on far more trips now than ever due to the lobby reforms. Some [older] lobbyists say it's a terrible thing, others say it's one in the same. Just a clever way around ethics. Any thoughts? Sorry it took me a while to get to your comment. I think it’s probably not a good thing that there are even more trips (STAFFDELS and CODELS) than before, because the reforms were supposed to curtail that. there are a bunch of problems with it, but the biggest is that it shows the American people that Congress is not really going to reform these things, and that causes the uprisings we have seen this year. Not good for the nation. @bernie.bros.4.trump: Lobbying is looked down on, but wouldn't you agree that it's our best career option after working here? The best way to make good on our investment in Hill experience? I can’t argue that it’s a great way to cash in on what you’re doing on the Hill. That’s not the issue. The issue is whether it’s good for the nation to think that the political class has a cozy deal at the expense of the nation. There is a tremendous amount of hate out there already. I see it every time I go to speak outside DC. That is not good. The skills you have built on the Hill can be used in almost any area of the business world, and most companies would kill to get a smart, aggressive Capitol Hill staffer. It’s sort of like the folks who come out of the Israeli military. The tech world scoops them up. They don’t want to continue in the war business (or at least most don’t) and they are able to use the incredible skills they are taught in a different world and succeed. @brony.montana: Who do you think is going to win game 6 tonight? I’m not much of a basketball expert, but, like most folks, I admire Steph Curry. I am more of a hockey fan these days, but am still in mourning over the Caps collapse. Ugh. @chesnut.ham: Who's more likely to be impeached, Trump or Hillary? I don’t think either will be impeached. After the Clinton impeachment, I think we’ll see a Constitutional Amendment sooner that we’ll see another impeachment – and I don’t think we’ll see a Constitutional Amendment in our lifetimes. @atherton319: If there was one law you could change/make to improve Congress, what would it be and why? I think Congress would benefit from a ban on lobbyists/clients giving money or being involved in the election process. I’m a bit of a radical on this, but I think the Senate would benefit from the elimination of the 17th Amendment, restoring the Founders intent to block the federal power grab from the states. @chesnut.ham: PS When will we get another good Kosher restaurant in DC? That’s quite a question from someone with the moniker chestnut ham! J unfortunately, I doubt we’ll get a good kosher restaurant. There isn’t sufficient financial support available in this city from the religious community for a restaurant. NY and LA have much larger observant communities and are able to sustain nice restaurants. Unfortunately, DC cannot. I wish I didn’t know this first hand, believe me! @chesnut.ham: You got me there! I just thought it was a quirky name... Now I am ashamed. Hahaah. I’m sorry!!!! (something I’m used to saying!!). @kerry.arnold: Has Congress only gotten worse and more disconnected from the people over the last decade? I’m not sure it’s worse than it was 10 years ago. Probably the same. The nation is just more aware of it, and they are not happy. Congress has low ratings, in part because they are perceived as out of touch. the bigger issue is that the federal government is too unwieldy. Congress is just the personification of this. @kerry.arnold: So smaller federal gov? Still on board with Grover's agenda? I haven’t seen him in years, but we usually agree, at least on domestic economic issues. Yes, I think the feds are too big. Part of that includes the fact that the feds impose prison sentences across the board (more big fed action) and put far too many people in prison. I know, I was there with many of them. I don’t want to keep you guys from solving the nation’s problems for too long, so I’ll sign off now. Thanks for all your considerate questions. It was a great pleasure to participate.